Some of the most adorable Christmas Felt Kits available are right here on this page. 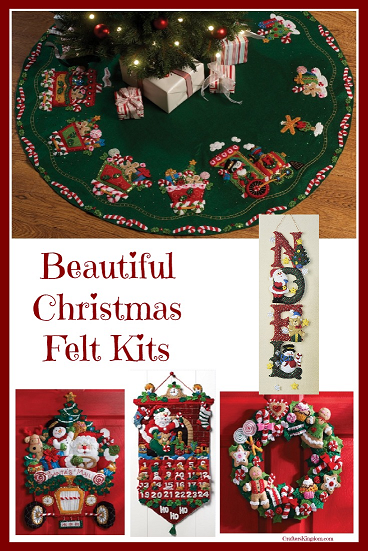 With these beautiful Christmas felt kits, you can create memorable decorations and gifts. You can give these Christmas felt kits to crafty friends, or you can make a lovely gift suitable for anyone. Hand crafted gifts are by far the most precious gifts to the recipient. They are traditionally the most popular Christmas gifts of all. Recipients of handmade items cherish them for a lifetime and think of their maker each time they display the gift. You can use these as is or complete the kit and then use your creation as an embellishment for another item. Let your imagination extend to find amazing ways to use felt kits for Christmas. For example, you could sew a felt reindeer (or Santa, or Frosty) on a tote bag or a pillow sham, or even a decorative towel for the guest bathroom. give your home that festive feeling. There isn’t anything more festive than the characters in this remarkable Christmas Felt Kit. Truly a delightful reminder of all the Christmas fun heading our way for the holidays. You can see the designs are detailed, colors vivid, topics are true to the Christmas traditions. Most of all, this kit will be fun to create, to give as a gift (completed or ready to work on), or to keep in your own decoration collection. Handmade gifts are one way you can express how much your friends and family mean to you. Taking the time to make hand crafted gifts is quickly becoming rare as our busy lives interfere with stopping to be creative. When you give yourself time to create you are saying more about you and those whom you care about than you may ever know. This kit might be confused with looking good enough to eat! 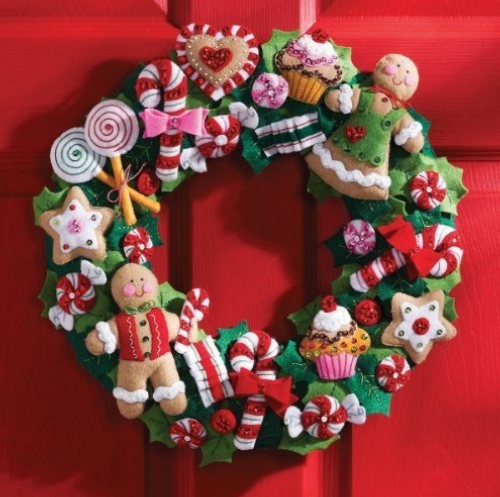 You can see how much fun this Cookies and Candy Wreath would be, especially for kids, grandchildren, or any holiday parties with the family. These wreath would certainly make a very welcome greeting to family, guests and friends for the holidays. What better way to symbolize the festivities of Christmas than with holiday cookies and candy! Tree skirts may be hidden from view for a while by the gifts under the tree, but when the gifts are all given out, a gorgeous tree skirt still decorates the area. A handmade tree shirt used year after year is a lovely tradition as well as a beautiful decoration. You can carry on the delightful holiday cheer outside of the kitchen by creating a gingerbread tree skirt. Or, perhaps you would prefer the train full of gifts and delightful treats below. Another fun symbol during the holidays is the train. Using the Candy Express Tree Skirt felt kit to create a great tree skirt or gift is one way you can bring the joy of the holidays into your decorating plan. The colors are traditional Christmas colors with a delightful ‘toy’ train applique design. Everyone young and old will love this train full of gifts and treats. An amazing wall hanging for the back of a door, side columns of the mantel, or simply to add a holiday decoration to any wall in the house. The size is perfect to put up in the kid’s room, the den, entry hall, or a spot in the dining room. With all of our favorite Christmas characters, this wall hanging is an instant greeting wishing guests a reminder of the celebration. The word “Noel” can be traced back to the Latin root, which means birthday, or relating to birth. Advent calendars are simply a great way to have fun counting down to Christmas day. With this adorable Santa felt advent calendar, you simply remove the felt piece in the daily pockets to mark the day. Once all the pieces are removed, it will be Christmas day. Of course, you might prefer to do the reverse in this case. I would hold the pieces aside in the beginning and add one each day. Therefore, I would be adding to the overall decoration daily instead of taking away. I often find the very best craft kits at extraordinary prices on Ebay. Click through to find a kit you love. Keep in mind, Ebay items do change frequently.